Block Testing, New Fabric and Kits! Earlier this week I posted a bit about Cotton + Steel, and today I wanted to share a bit of what I'm doing with the fabric right now. I grabbed a stack from the basics collections and have been testing a new block I'm making for a soon-to-be project. 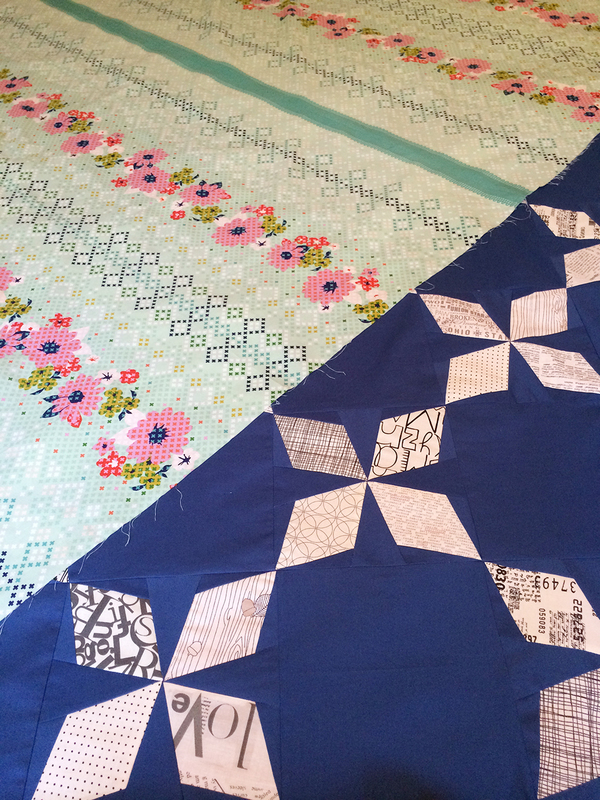 I'm not going to be making the final quilt in these fabrics, but thought they would be fun to test with! I also pulled out my Arkansas Traveler work in progress and decided to go sort of bold for the backing. This print is from the Mustang line by Melody Miller for Cotton + Steel. I also recently added a few more prints to my stash from Joel Dewberry's Birch Farm line (left 2 prints) and Anna Maria Horner's Pretty Potent line. I think the Birch Farm prints will be a great addition to my low volume collection, and Anna Maria Horner's prints...well I just love her designs and colors and I will easily work those into future quilts. In other fun news to share, I've kitted a couple of my patterns for online shop Fabric Spark. I selected fabrics that I think work perfectly for my Island Girl and Twilight Patterns. I know coming up with fabrics for a pattern can be one of the hardest parts, so I hope this makes the process easier and painless! And finally...you guys, I've been so busy sewing this week. I finished up my quilt with the Kona flying geese. I just need to get a chance to go out and take pictures. In the meantime, here is a sneak peek. I did some fun playing with negative space that you can't see here...hopefully that will be enough of a tease for you to come back next week and check out the finished quilt!